It’s very likely that we all know someone who has been diagnosed with Breast Cancer. According to the National Breast Cancer Foundation, one in eight women will be diagnosed with breast cancer in her lifetime, and Breast Cancer is the leading cause of cancer death among women. They also report that while male breast cancer is rare, an estimated 2,470 men are diagnosed every year. The only answer to stemming the tide is research, and research is costly. We want to help! 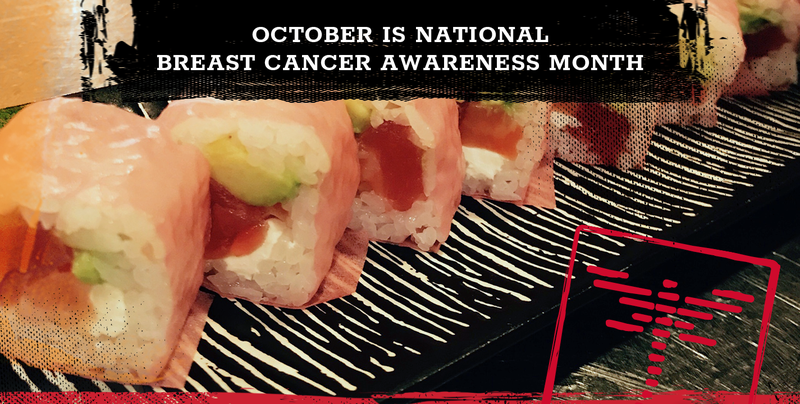 For the month of October, you can substitute the nori in any maki roll with pink-soy paper for $1. For every pink-soy paper roll we sell, we’ll donate $1 to the Florida Breast Cancer Foundation. So, join us in support of breast cancer awareness and research all October. Arigato!